Glancing that, I'd easily think it was a photo, Madbat. So, ISO it is then. Thanks for that, Gedd. I would suspect that not having those walls behind the camera is the reason you needed such high lumens. As for rays heading out to space, yes they do, but they also bounce back from the atmosphere which would change things if iray actually had one perhaps. I'm remembering back in my Bryce days (tried to start using again but interface gadgets and text are so tiny I can't handle it at all anymore) that there was an imaginary 'wall' surrounding the scene space---IIRC---about 40,000 or 400,000 units away?---which bounced the outgoing light back into the scene. Anyone? Or am I imagining it? I find myself resorting to absurd f/stops, like 64, to get decent shots of full figures from relatively close. Otherwise, say, the face is in focus but the leg or hands further back are out of focus a little. In regular ol' 3Delight (sounds like a whip topping!) I regularly use high f stops up to 72 to control depth of field. In outdoor scenes I want a little blur, just enough to give the impression of distance without being blatant. But in the basement scene, I was using all that to control light. One things for sure. By the time this is all done and 4.8 is on the shelf, we'll all know a lot more about camera's and lighting than we did before. I'm liking Iray, it just needs a bit of a different approach. And from what I see , model/texture quality and optimization come into play here. I'm curious as to what all effects render times. I know sheer # of lumens does. Some scenes take longer than others. One reason I suspect (knowing squat about physically based rendering and GI in general) is more surface geometry = more bounces needed. That basement scene actually has a lot of surfaces in it, especially the floor grating. That's modeled, tiny holes and all. Plus there's area above the ceiling tiles, area below the floor grating, shelves, boxes, and floor debris...and whammo, 48 minute render time. I'd hate to think what that would take in 3Delight. I've had render times in days before. I'm thinking that enclosing the space entirely will make a difference. I'll try that as soon as Update Tuesday gives me my computer back. What I do wish for is a second card to run my monitor. When Iray gets working hard, forget about using my mouse. But for some dumb reason my power supply has a bare minimum of plus, so no extra card for me. Cheers Casual I will take a look at that later. Oh, also, migrate all bump to displacement with, oh, range of 0 min .2 max and subd3. I think. If you haven't closed DAZ Studio, you don't have to rerender your last image. Just go to the File menu and look for "Save Last Render." ...Daz 4.8 basically crashed. There was no way to save it. I ended up having to hide one of two characters (and all their stuff) and render, then unhide it, and hide the other one. The first render was using 3,992MB of my 4GB 740. The second image is currently running, using 3,947MB of that 4GB. Most of the scene is the same, except for the characters and what they're wearing and holding. Anyway, just thought I'd put that note out there. Yeah, I'm finding SubD is to be avoided whenever possible. Too many objects with it and the computer just locks. So... the G2 presets look amazing in a close up (with just a little work). From a distance, however... not so much. You lose the photographic feel as you pull the camera back. Any ideas/suggestions on how to retain that realism at a distance? Are you using Depth of field? That can be key for a feeling of realism. While DOF might help the overall realism of an image, its not going to help with the materials... which are the problem. They are amazing in a close up shot, but lose the photoreal effect at a distance. DON'T CANCEL YOUR RENDER WINDOW! !...or else crash bandicoot! I haven't had DS crash when cancelling the window - either using the cancel button or the window's close button - but closing the window does lose the render -in-progress, which you might want to look at, so using the progress bar is a good idea anyway. If you do get crashes closing via the render window please report that as a bug. good idea, another bug I found is rendering Aiko3 with angelyna wings...iRay can´t pass of the iteration 1!!! 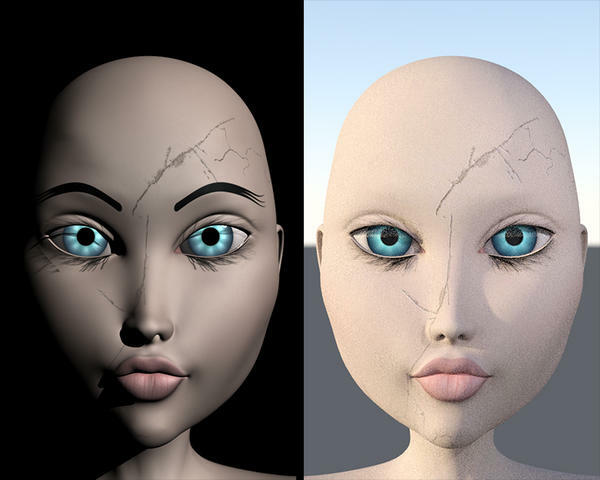 Is there a way to get eyebrow masks working in Iray? For at the moment, the eyebrows simply vanish. Level 17 scene lit with one sphere primitive with emission shader applied. Iv turned Two sided light option ON, switched Luminance Units to W, set Luminous Efficacy to 100 (in surfaces tab of the sphere). Yes. When you Ctrl-click on the shader and ignore textures, the alpha map will be preserved. Used on the Genesis BJD brow today. I'm trying to do some Gen1 characters with translucence, but I keep running into a problem where it appears the edges of the model aren't lining up perfectly. I'm kind of at a loss... I've tried upping SubD to 3 (didn't help), changing the edge interpolation, changing rendering quality, bupkis. It works fine in Base resolution, but then shadows look terrible on the figure. Any ideas, or am I just going to give up on translucence for Gen1? First, is that Genesis 1 or generation 1 (i.e., Vicky or Michael 1)? Second, a screen shot might help, but could it be possible that one part of the body has a different or missing displacement map? Base resolution could be blurring out the effect, which shows up when there's more topology to move. Genesis 1, working on a screenshot now. Will doublecheck displacement maps when it completes.